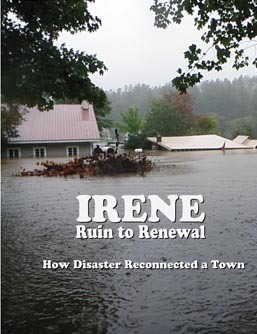 “Wow” is all I can say about Irene: Ruin to Renewal, the collaborative effort between the Plymouth Historical Society and LPCTV. I know it took considerable effort by a number of people to bring all the pieces together, but the result is a very professional portrayal of the devastation, along with the compassion and the resilience of our community. I can’t wait to obtain a copy of the video! Laurence noted in the video the town-wide party that was held in his tent at the Echo Lake Inn. I believe there were at least 200 people who came together to mark the one year anniversary and to celebrate the way the community responded with helping hands and caring hearts. The planning committee for the event, Pieter Bowen, Russ Tonkin, Jim Neilsen, and Tina and Bruce Verdrager represented the various parts of town and we even enjoyed treats by Tina when we met! Everyone provided food, with Jim serving up a substantial amount from Hawk that day. Fond memories. Riding there this morning I was reminded of the wedding that I officiated at Hawk after the flood. The bride had so looked forward to crossing over the bridge into the field to join the groom. However, the ceremony took place on the only grassy area, at the corner of Salt Ash and Billings Roads. The tent for the reception was set up in front of the library and potted plants were strategically placed, hiding the bleakness of the surrounding area and generating hope for the couple and for the town. Again this year there will be a performance of “Shakespeare! Alive” at noon at the Union Christian Church on 9/3 when this beloved group of professional actors will regale us with humorous interpretations of the Bard’s writings. Don’t forget the 11th Annual Plymouth Folk and Blues Festival 9/3-4 starting at 2:00 PM both days with a fabulous line-up of performers organized by Jay Ottaway. Bring a donation for the VT Foodbank and relax with others who appreciate good music. Enjoy other activities for the whole family at the Historic Site – something for all ages! This entry was posted in Community News and tagged Christian Union Church, Echo Lake Inn, LPCTV, Plymouth Folk and Blues Festival, Plymouth Historical Society, Shakespeare Alive, Tropical Storm Irene. Bookmark the permalink.